I had my first taste of boarding school when I was 11 years old. At the time, I used to whistle Bob Dylan’s song Blowin’ in the Wind out of habit. I liked the lyrics and the melody, and it appealed to my feeling for a new life that I neither knew nor understood. That’s how it is when you’re living away from your family for the first time. Suddenly you don’t know any of the answers and all of the cardinal points of your life are missing. As I kicked my way through the heaps of autumn leaves whistling Dylan, I had to learn the map of my new world, slowly and sometimes painfully. Where to get help from fearsome Matron if you cut your leg open, why our chemistry teacher lived in his own outbuilding, at home among the Bunsen burners and the stink of the Bromide cupboard; I learned the winding path through the woods to the great prairie of the cricket ground. After a while, I was let in on the some of the happy secrets of my new environment – the derelict old chapel where we played soccer at lunchtime, with pews for goals and old mattresses for penalty boxes, the leafy nooks where you could meet girls from the nearby Catholic convent school and smoke cigarettes. I learned how to recognise the oncoming footfall of the thundering Latin teacher from a distance of one hundred yards; an ex-middleweight champion with a forehead as big as a cliff taught me the noble art of self-defence. I began to feel as if I belonged, and with stability came growth. It’s a simple equation in any area of life. For growth to occur, the surrounding environment must be reliable. You must know where you stand, and be convinced that the people around you are thinking in your best interests. In rugby terms, the one question which the Wallabies coaches have to ask themselves after Saturday’s defeat at Twickenham is: are we creating a stable environment for the growth of the players? The answer to that question at the moment is: too many. The confusion of multiple or ever-changing roles is denying players at all stages of their careers a real chance to grow, or showcase their talents to best effect. Prop Sekope Kepu won his 100th Wallabies cap against the All Blacks in Yokohama last month. He has been a magnificent servant of Australian rugby, but it is hard to overcome the impression that, in his twilight years, he is being messed around by the selection policy. After starting the season in his accustomed position on the tight-head for both the Waratahs and the Wallabies, he was moved to loose-head for the last three rounds of the Rugby Championship. In fairness, the switch worked out well but, just as Kepu was reacquainting himself with the demands there, he was moved back to the other side for the clash at Twickenham. Anyone with experience of the front row will tell you how hard it is to switch sides without losing effectiveness. The demands and even the mindset of the two positions are completely different. It is, however, a policy Michael Cheika has pursued consistently, moving Allan Alaalatoa from number 1 to number 3 and then shifting Tom Robertson in the other direction. While Alaalatoa’s switch, in particular, was probably the right one, it occurred without a stable backdrop. He had not played any games of Super Rugby in his new position and therefore was not primed for success. It is to his great credit that he has established himself despite that unpromising beginning. Over the weekend, Kepu was moved back to tight-head and Jermaine Ainsley (who has played all of his Super Rugby career at number 3) played on the opposite side. Unsurprisingly, Australia conceded five scrum penalties, despite the moderate pretensions of an England front-row who are themselves learning the ropes at international level. 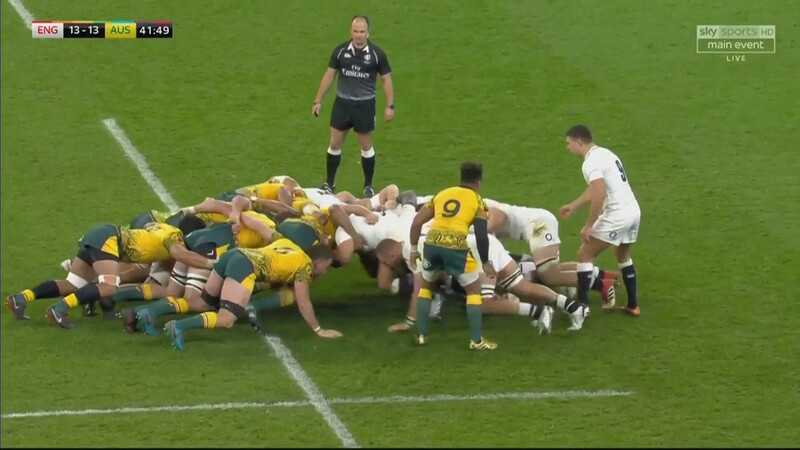 Sekope Kepu was still trying to remember how to play tight-head when England settled into their first scrum of the game on the Australian goal-line in only the second minute. England drove forward and Johnny May scored an easy try in the corner. A clue to Kepu’s suffering occurred when he swung ‘camera side’ early in the second half. This is an example of one of the worst positions in which a tight-head can find himself. His right shoulder is up and he has no control of his opponent with the bind. At the same time, he is angled inside and the loose-head has burrowed in under his exposed rib-cage. There is no way a tight-head can deploy any power in this situation. The tidy operator that he is, Ben Moon could scarcely believe his luck after the much tougher tests he had endured against South Africa and New Zealand. Things did not get any better for Australia off the bench, and this was principally due to the fact Jermaine Ainsley was playing in a totally unfamiliar position. In the backline, young Jack Maddocks was picked to play at number 11. If Maddocks has an international future – which I believe he does – it must be at 10 or 15. The situation was complicated by the fact that he was asked to pick up the specialist open-side wing role I described a few weeks ago. If Marika Koroibete was struggling with the requirements of the role, what price Maddocks? The answer came as early as the eighth minute. 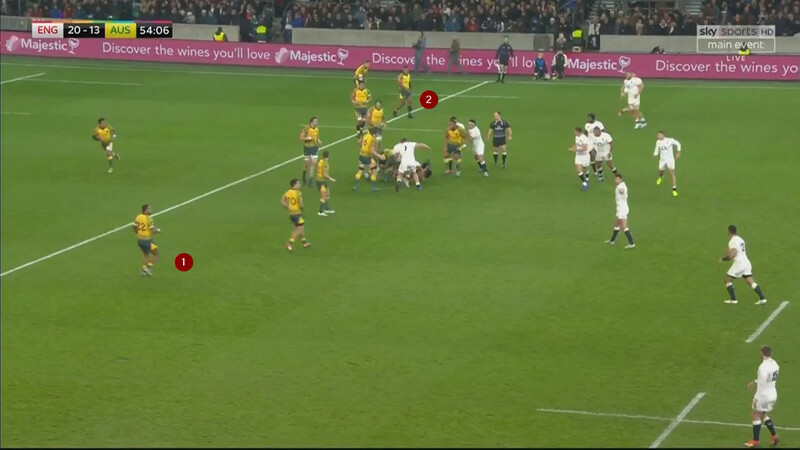 After the Wallabies’ second botched exit of the game, Maddocks first found himself defending on the open-side wing on the left. After Jack Dempsey made a turnover on the 22-metre line, Maddocks was then required to run all the way across to the far side to chase a kick out to the right. 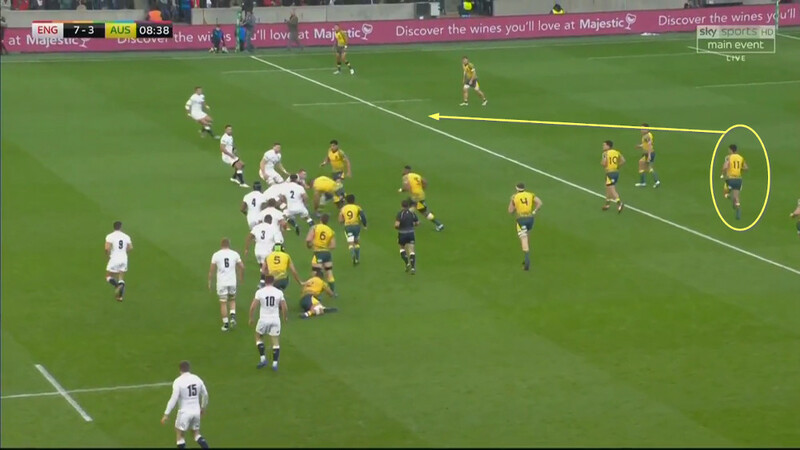 Maddocks successfully made the follow-up tackle on May, but England were able to break down the undermanned short-side on the following phase. 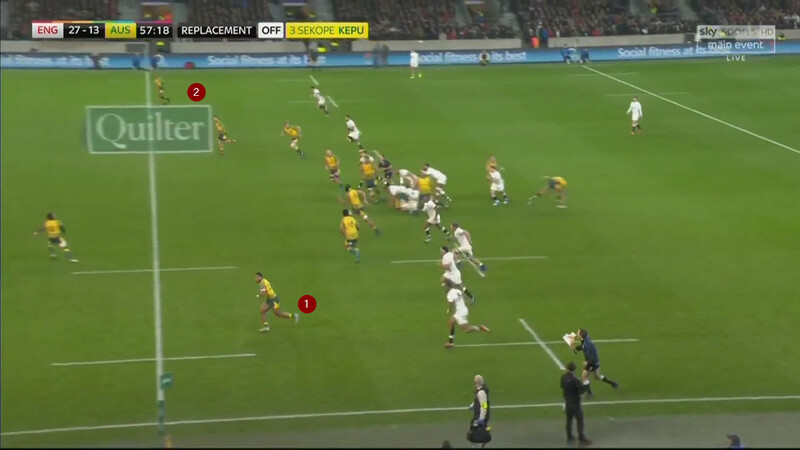 Maddocks was still busy running back to his post on the left wing when England made their next break as play bounced back in from the sideline. Kyle Sinckler took the gap, and the downfield tackle was made by none other than… Maddocks! The original point Drew Michell made about overworking the wing in this scenario resurfaced to telling effect. Is was an efficient use of Maddocks’ time and energy, and did it encourage him to settle into the game and give of his best? Emphatically no. He missed an important tackle on Elliott Daly for another England line-break later in the half, lost two bits of ball in the tackle and was subbed off at halftime. That is your answer, if you have the courage to pick it up. His replacement, Sefa Naivalu, fared little better. After being required to defend at outside centre for most of the match in Yokohama, he was not allowed to settle into his nominal role on the left wing at Twickenham. In these two instances – the first after a couple of phases from scrum, the second after a Wallaby kick-off – the system bizarrely required Samu Kerevi to defend on the left wing, with Naivalu over on the right. England wing Joe Cokanasiga scored a try at the end of the first sequence, and Australia turned over possession in the second. It was no accident Dane Haylett-Petty dropped the ball – he was probably too busy wondering if he was the right man to catch it! Naivalu finally made it back to his natural position for a clearance kick by Matt Toomua. 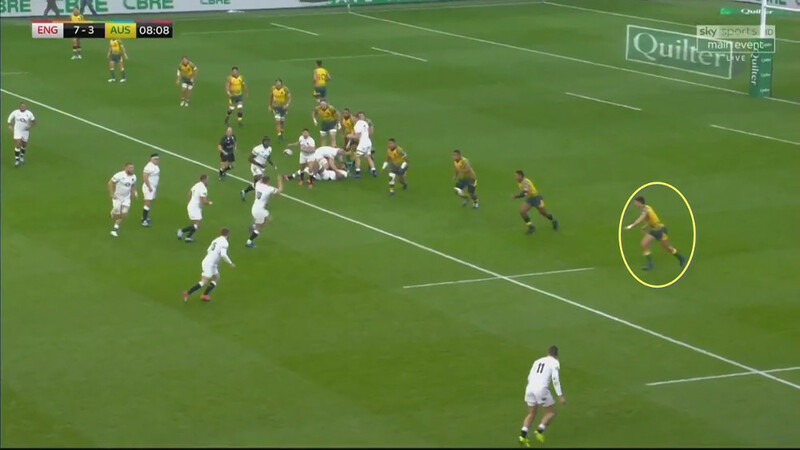 With a nice choice between Israel Folau’s leaping skills on the far right and Naivalu’s closing speed on chase down the left, Toomua inexplicably chose to kick for Bernard Foley in the middle of the field. 6’4” of Cokanasiga gleefully made the catch over 5’10” of Foley and set off on a run he really ought to have crowned with a try. Somehow that typified Australia’s afternoon. “There ain’t too much I can say about this song except that the answer is blowing in the wind. It ain’t in no book or movie or TV show or discussion group… Too many of these hip people are telling me where the answer is but oh, I won’t believe that. Australia’s selection policy off the field, and their positional changes on it are just like Dylan’s restless piece of paper. Nobody in the playing squad gets the chance to read the answer because it’s still “got to come down some”. When someone bends down to pick it up, it flies away. Just when Sekope Kepu is beginning to enjoy his last few games as a Wallaby on the left side of the scrum, he’s required to move back to the right and receives an ill-deserved stuffing. Just as young Jack Maddocks is looking to establish himself as an international player at 10 or 15, he finds himself trying to play a complicated role on the wing for which he is ill-suited. Maybe he should have talked to Marika Koroibete and Sefa Naivalu first. No stability, no growth. The unwillingness of the Wallaby coaches to embrace the simplicity of this truth is becoming ever more bewildering. Let everyone selected for the Test team concentrate on their core role and learn all of its nuances inside out. No movement beyond that – or else the answer to Wallaby woes my friends, will always be elusive. Always blowin’ in the wind.